LUXURIOUS DESIGN: 800 Thread Count, Luxurious Design Sheets & Pillow Cases. This Gorgeous Bedding Set Looks Very Elegant. It Is A Simple And Sophisticated Way To Enhance Any Bedroom'S Look. 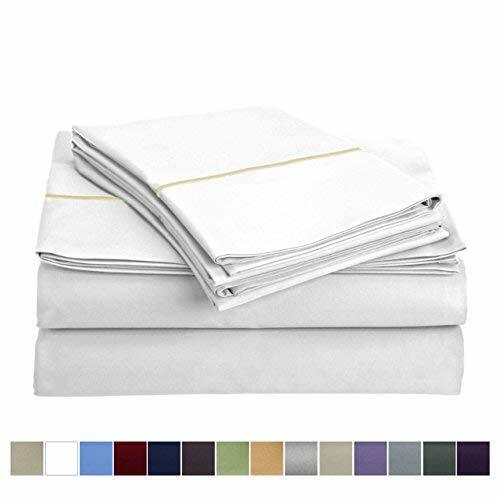 PACKAGE CONTAINS: 1-Flat Sheet (108"X102") 1-Fitted Sheet (72"X84" + 15" Deep Pocket) 2-Pillow Case (20"X40"). The Fitted Sheet Has A 15" Deep Pocket For Oversized Mattresses With Elastic All The Way Around For Best Fit. If you have any questions about this product by Audley Home, contact us by completing and submitting the form below. If you are looking for a specif part number, please include it with your message.